Coll. No. 1456, 27 June 2016, characters observed: Low-growing perennial, to 20 cm. ; Stem, straight slender unequal prickles, present on new growth; Leaves, alternate, compound, leaflets (7-8) 9, 20 mm. × 9 mm. wide, serrate, teeth dark-tipped, unclear whether there is glandular exudate, sparsely villous on both sides; Flowers, in clusters of 2-5; Sepals, 16 mm. × 3 mm. wide, abaxial, stalked glandular, adaxial, glandular hairy; Petals, 28 mm. × 21 mm. wide, color pink. Field Notes: Coll. No. 1456, 27 Jun 2016. 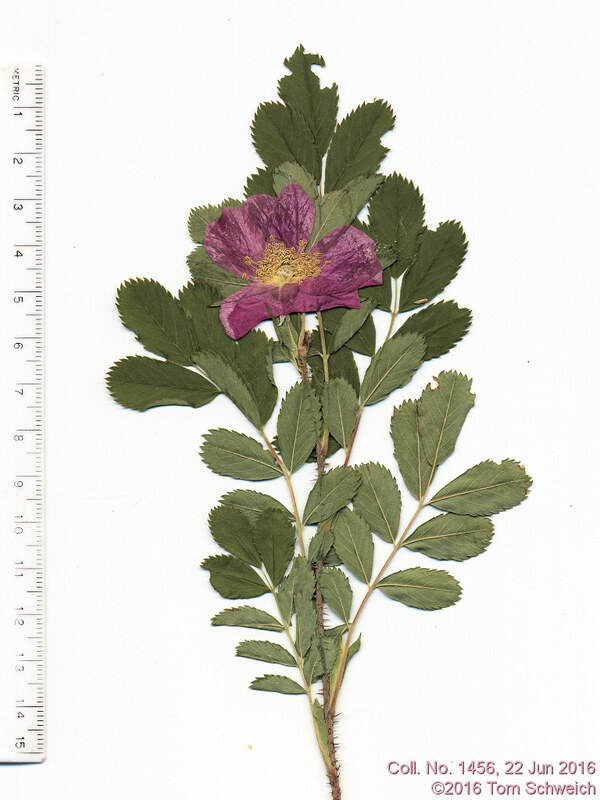 Other photos about Species - Rosaceae or Rosaceae Rosa arkansana.